In 2018, the Omega Seamaster Diver 300M marked its quarter-century anniversary. To celebrate the occasion, Omega gave their famous dive watch collection a fantastic refresh. Let’s find out what the changes are by delving into one of the models from the new 25th anniversary Omega Seamaster Diver 300M watch collection. 25th Anniversary Omega Seamaster Diver 300M, What Changed? 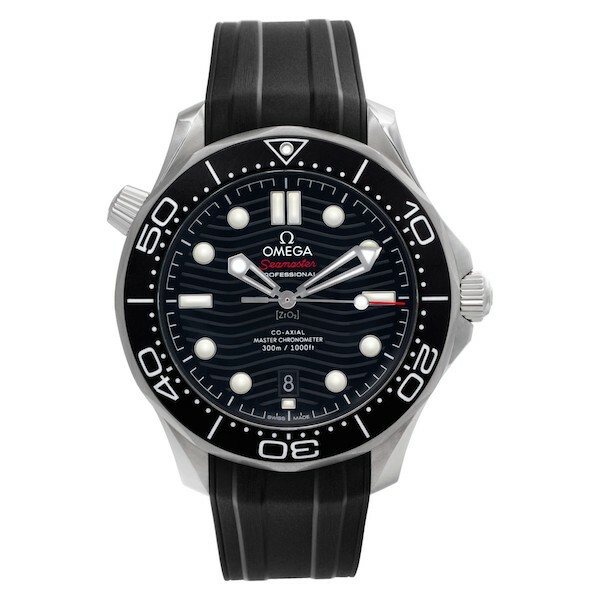 Although Omega makes several dive watch models, such as the Planet Ocean, the Ploprof, and the Seamaster 300, the Diver 300M has proven to be the most popular option. Even James Bond opts for the Omega Seamaster Diver 300M! 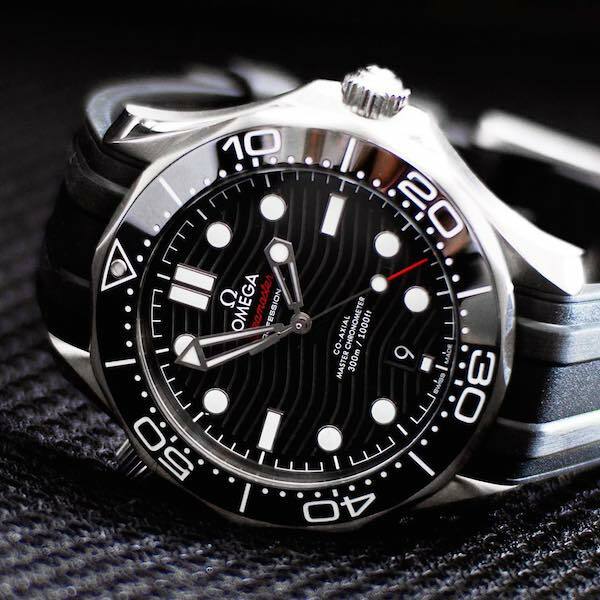 With the new versions, Omega maintains the fundamentals of their dive watch design while adding some great new details. For instance, the Seamaster Diver 300M grew by 1mm to now sport a 42 mm case size. However, there’s good news for owners of older versions of the Diver 300M. Because the space between the lugs has not changed (20mm), you can still use straps from preceding Seamaster Diver 300M editions on the new models. While the unidirectional bezels are still made from ceramic (a material that made its debut on the Seamaster Diver 300M in 2012), Omega updated them to use either white enamel or Ceragold (depending on the model) for the diving scale markings. The dials of the new 25th anniversary Omega Seamaster Diver 300M also underwent a facelift. 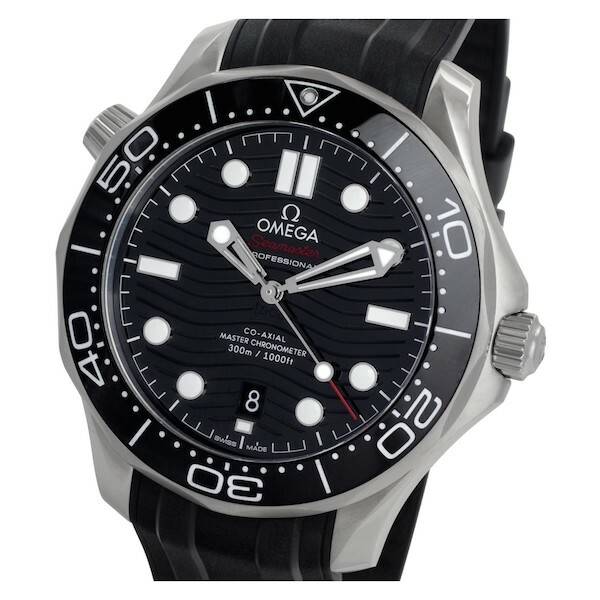 The ceramic dials welcome back the famed wave pattern (now laser engraved), which Omega phased out in 2012. The skeletonized hands have also been subtly reshaped and have slightly more luminescence. Even the lume-filled round and baton hour markers have been raised to add more depth to the face of the watch. Plus, the date window has moved to 6 o’clock. A signature design trait of the Diver 300M is the helium escape valve at 10 o’clock. Not only does the new HEV feature a conical shape but users can now safely open it underwater thanks to an ingenious Omega patent. For those who are unsure of the purpose of an HEV, it is a mechanism that automatically releases built-up gasses in a watch to prevent the crystal from popping off from too much pressure. When Omega released the new 25th Anniversary Omega Seamaster Diver 300M collection at Baselworld 2018, there were 14 models in total, with a wide range of materials, dial colors, and bracelets options to choose from. 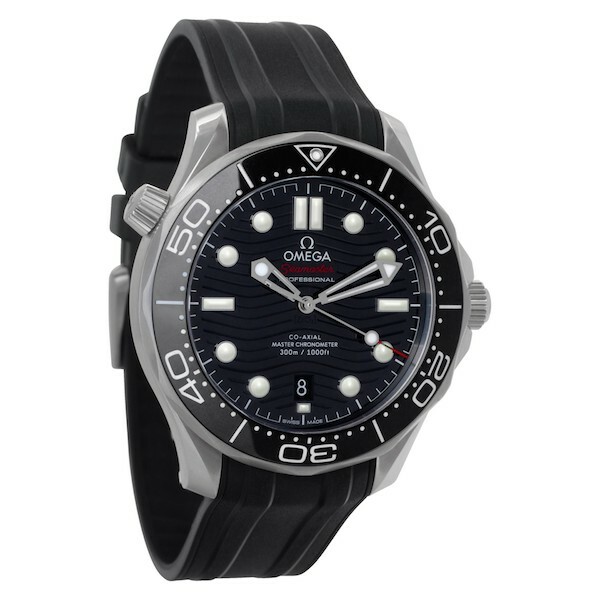 A particularly sleek edition is the Omega Seamaster Diver 300M ref. 210.32.42.20.01.001 with a stainless steel case, black dial, black ceramic bezel, and black integrated rubber strap. Finishing off the strap is a stainless steel pin buckle, complete with the Omega logo. Flip the watch around and you will see even more new features. To begin with, there’s the sapphire exhibition caseback–a first for the Seamaster Diver 300M. What’s more, powering the new 25th anniversary Omega Seamaster Diver 300M collection is the Omega Master Chronometer Cal. 8800 with a 55-hour power reserve. 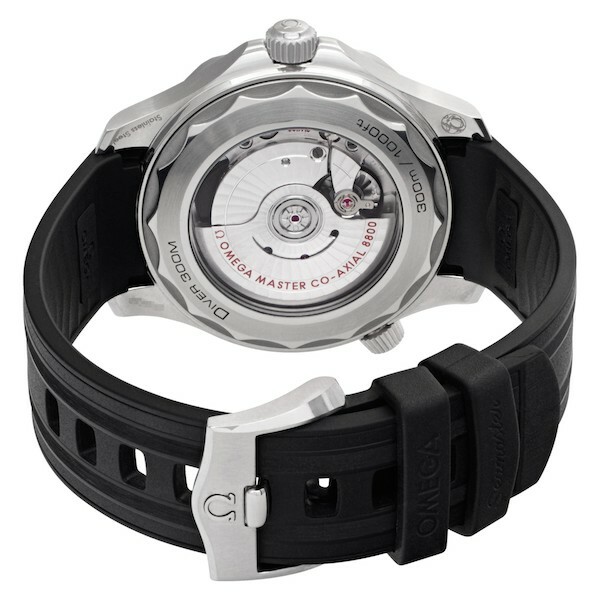 In addition to being an in-house automatic movement, Cal. 8800 is also certified by METAS to ensure optimal precision and anti-magnetic resistance. For fans of Omega (or of luxury dive watches in general) the new 25th anniversary Seamaster Diver 300M watches check all the boxes. They seamlessly bring together a whole host of modern touches while staying true to the original spirit of the original Seamaster Diver 300M from 1993. All The Right Angles: Five Iconic Square Watches For Men While much less popular than round timepieces, there’s something very appealing about square watches.